MADE them feared by their foes and respected by their allies. The Rangers are legendary airborne warriors on par with the Royal Marines Commandos! Anyone, libtards excluded, who sees this wind swept crop of hard rock with 100 feet high unforgiving vertical cliffs can only wonder…and be absolutely awestruck at the feat of arms that was accomplished here, not so very long ago. Against near overwhelming odds, the Rangers struck at dawn and prevailed. Scaling the cliffs under enemy fire, when a Ranger fell, another took his place with steely determination. Despite very heavy loss of life failure was not an option. I thought of how the Rangers must have felt, huddled in their LCA (Landing Craft Assault)..battered by choppy rough seas, wild wicked waves, splashed by salty sea spray…as they moved ever nearer. Clutching their rifles with cold fingers. They knew that waiting for them were battled hardened Wehrmacht soldiers and fanatical Nazis. All armed to the teeth in reinforced concrete bunkers. Their main weapon Suprise! As the Regiment says: Speed Aggression Suprise. The hallmark of the intrepid SAS. Going into certain death or almost certain death…How does it feel? Not good. Clammy palms. Thoughts of loved ones. Their last kiss. Their happy smile. Thinking, will I ever see them again. Then..when the action begins. The adrenaline rush. Training takes over. Courage is being able to act while terrified. Kill or be killed. I was at Pointe du Hoc. Seventy three years almost to the day…Looking at the choppy wild waves of the sea…I said a prayer for those that died. Life and death came fast and furious to many on that day. The cold, biting wind cut through my light windbreaker. The sky was bright but with many grey clouds. My Breitling titanium chronograph told me it was 11:38. It was summer. Cold. Very windy. At the SAS – simple and stark, Ranger Memorial, I sang Edith Piaf’s famous song which she dedicated to La Legion Etrangere, “Je ne regrette rien!” in honour of these brave and indomitable warriors. Tears of inspiration and much respect welled up in my eyes. Past memories came flooding inside my mind. It was an emotional moment. Many bomb and shell craters dot this war torn landscape that is preserved like in a time warp just like it was all those 73 years ago…Looks like what we know of the moon’s surface. At the C3 (Command Control Communications) centre of the German garrison at Pointe du Hoc the blackened scorch marks of thermite incendiary grenades can still be seen… plus many bullet holes and shrapnel marks gouged out in the reinforced concrete. At H Hour, 0630, the three companies of the 2nd Rangers, led by Colonel Rudder, were scheduled to touch down at the foot of the cliffs and deliver their assault. They totaled about 225 men, including a headquarters detachment. The three companies selected for the mission at Pointe du Hoe had received intensive secret training. Special equipment was developed for the operation. During April and May, at Swanage near the picturesque Isle of Wight, the Rangers trained hard for their lives depended on it. Intense practice in rope and ladder work on rugged cliffs like those of the French coast, combined with landing exercises in difficult choppy waters were carried out. Swanage is actually on the remote Isle of Purbeck on the British mainland. Battle hardened firebrand British Commandoes gave all possible help, based on their bloody experience in hit and run coastal raids. As a result of experiments with all types of equipment for escalade, main reliance was placed on ropes to be carried over the cliff tops…fired by rockets! In addition the assault wave would take along extension ladders. British landing craft (LCA’s) with British crews were used both in the training and in the actual operation. Ten LCA’s were deemed sufficient to boat the three small Ranger companies and headquarters party, including signal and medical personnel. Each craft had 21-22 men Each Ranger company averaged 65 Rangers. Each LCA was fitted with three pairs of rocket mounts, at bow, amidship, and stern, wired so that they could be fired in series of pairs from one control point at the stern. Ropes were carried by one pair of rockets, affixed to the rocket’s base by a connecting wire. A second pair was rigged for rope of the same size fitted with toggles, small wooden crossbars a few inches long inserted at about one-foot intervals ; the third pair of rockets was attached to light rope ladders with rungs every two feet. The rockets were headed by grapnels. The rope or ladder for each rocket was coiled in a box directly behind the rocket mount. Each craft carried, in addition to the six mounted rockets, a pair of small, hand-projector-type rockets attached to plain ropes. These mobile launchers could be easily carried ashore if necessary. Extension ladders were of two types. One, carried by each LCA, consisted of 112 feet of tubular-steel, 4-foot sections weighing 4 pounds each. These ladders were partly assembled in advance in 16-foot lengths. For mounting the whole ladder in escalade work, a man would climb to the top of a length, haul up and attach the next 16-foot section, and repeat this process until the necessary height was reached. As a final auxiliary for climbing, four DUKWs would come in close behind the first wave, each carrying a 100-foot extension ladder, fire-department type, with three folding sections. Two Lewis machine guns were mounted at the top of each of these ladders, which would be particularly useful for getting up supplies. Speed was essential for this operation, and the small assault force was equipped for intense speed & shock (SAS) action of limited duration, with a minimum load of supplies and weapons. Dressed in fatigue uniform, each Ranger carried only a D-bar for rations, two “pineapple” grenades, and his weapon, normally the M-1 rifle plus ammunition. A few of the men selected for going first up the ropes carried .45 caliber pistols or .30 caliber M1-carbines. Heavier weapons were limited to four BAR’s and two light mortars per company. The BAR aka Browning Automatic Rifle. A very heavy weapon with a 20 round magazine that is very unwieldy but reliable in combat. 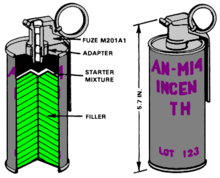 M14 Incendiary Thermite grenades. Also used by elite teams of MACV-SOG on TOP secret missions behind enemy lines in VN, Laos and Cambodia to incinerate themselves beyond identification if in danger of being captured by the vile viet-cong. Ten Thermite grenades, for demolition, were distributed within each company. Two supply boats (LCA’s) would come in a few minutes after the assault wave, with packs, extra rations and ammunition, two 81 -mm mortars, demolitions, and equipment for hauling supplies up the cliff. 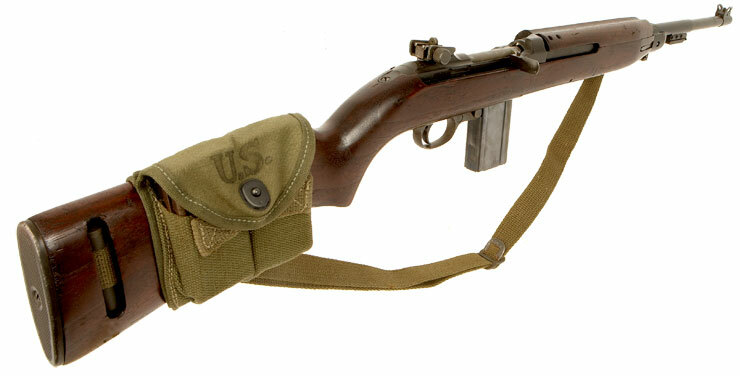 The M-1 Carbine is a beautiful and compact weapon…but having used them, I can tell you that it is only good for close work and lacks stopping power. The powerful and very accurate autoloading M1 Garand rifle with three 8-round clips..far superior to the German Wehrmacht’s bolt action Mauser rifle. The tactical plan provided for Companies E and F to assault on the east side of the Point, and Company D on the west . On reaching the cliff top, each boat team had a series of specific objectives, beginning with the gun emplacements and other fortifications on the Point. With these first objectives taken, most of the force was to push out immediately to the south, reach the coastal highway which was a main communications lateral for German defenses of the Grandcamp-Vierville coast, and hold a position controlling that road to the west until the arrival of the 116th Infantry from Vierville. If the assault at Omaha went according to schedule, the 116th would be at Pointe du Hoe before noon. Long before then, the main body of Rangers (eight companies) should have followed in at the Point to strengthen the foothold won by the initial assault. As a final feature of the plans, fire support after the landing would be available on call from supporting naval craft and from artillery landing after 0800 near Vierville. A Naval Shore Fire Control Party (12 men) and a forward observer of the 58th Armored Field Artillery Battalion were attached to Colonel Rudder’s headquarters, which was distributed among the four LCA’s carrying Company E.
D-Day weather was unfavorable for a landing assault, with rough seas that imperiled small landing craft during their approach to the beaches. The sea here is very rough even in good days with powerful waves! Early visibility along the coast was poor, and an eastward-setting tidal current helped to produce errors in navigation. The results, on the Omaha Beach sectors, were delays in reaching shore and enough mislanding of assault craft to interfere seriously with the early schedule for the attack. The Ranger force did not escape these difficulties. The nine LCA’s touched down on a front of about 500 yards, the right-hand craft just under the tip of Pointe du Hoe, and the others spaced fairly evenly. No great distance separated some -of the boat teams, but according to plan they went into action as separate units, each facing its particular problems of escalade and opposition. In certain general respects, their problems were similar. The 30-yard strip of beach between water and cliff had been completely cratered by bombs. The craters were to handicap the unloading of men and supplies and were to render the DUKWs useless after landing, for these craft were nowhere able to cross the sand and get close enough to the cliff to reach it with their extension ladders. The cliff face showed extensive marks of the naval and air bombardment; huge chunks of the top had been torn out, forming talus mounds at the base. A few grenades were thrown down or rolled over the edge as the first Rangers crossed the sand, and enemy small-arms fire came from scattered points along the cliff edge. Particularly dangerous was enfilade fire, including automatic weapons, from the German position on the left flank of the beach. Once at the foot of the cliff the Rangers were better off, for the piles of debris gave partial defilade from the flanking fires, and the enemy directly above would have to expose themselves in order to place observed fire or to aim their grenades. Naval support came to the aid of the Rangers at this critical moment. The Rangers that had made it to the beach made their way up to the base of the cliff just west of the draw. Only 31 men of C Company made it so far. With the Ranger force pinned down, 4 soldiers, Lt William Moody, Lt Sidney Saloman, Sgt Julius Belcher and Sgt Richard Garrett, began to pick their way up a small crevice using their bayonets for leverage until they finally reached the top of the cliff. They quickly dropped ropes and the Rangers began to climb. By 07.30, C Company was on top of the ridge facing a fortified house. M1 Garand rifle bayonet..Cold steel, they don’t like it up them. Sgt Lomell firing his Thompson SMG…he lived to tell the tale. 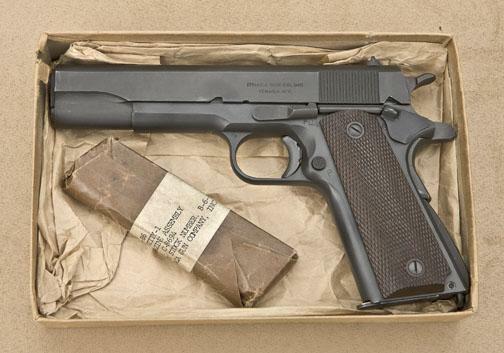 Thompson Sub-machine Gun .45ACP improved version. Good stopping power. Also used by US Special Forces in Vietnam. The Rangers assaulted the house and Lt Moody kicked in the door, killed the officer in charge and led the search of the trenches dug behind. The Rangers began the systematic destruction of the pillboxes and positions using grenades, rifles and even their bayonets. Lt Moody was killed clearing one pillbox and command fell to Lt Saloman. Vicious no holds barred hand to hand fighting ensued. Kill or be killed. Sgt Belcher led a furious charge of the German machine gun positions that were pouring a murderous fire down onto Omaha. Using white phosphorous grenades, the Rangers coolly shot the Germans as they fled the burning positions. I saw the black burn marks myself from the incendiary grenades in the German Command, Control & Communications casement. Companies A and B of the 2nd Ranger Battalion and the entire 5th Ranger Battalion, came ashore at Omaha shortly before 08.00 and drove inland to link up with C Company. BOMB AND SHELL HOLES in the narrow strip of rocky beach, at the foot of the cliffs, slowed the Rangers in getting to the shelter of the cliffs after landing. They perservered with iron will and won the day. Of the 225 Rangers in the assault force, only 90 survived. A monumental feat of arms that will never be forgotten. Rangers lead the way. In memory of James Earl Rudder, 1910–1970, Class of 1932, Heroic Soldier, Commissioner of the General Land Office of Texas, Sixteenth President of Texas A&M University … Third President of the Texas A&M University System.Earl Rudder was architect of the dream that produced this center. In this, as in all he did, he demonstrated uncommon ability to inspire men and lead them to exceptional achievement. A great and remarkable gentleman, in peace and in war. Rangers lead the way. This entry was posted in Food and drink, Friends & Comrades, History, Let them eat Cake..., News and politics, Nobody's perfect..., Organizations, Philosophy, Snacks & Little Bites, Travel, Uncategorized, Voyages and tagged Colonel Rudder, D Day ww2, Derring-do, Kill or be killed, M1 Carbine .30 caliber, M1 Garand rifle, Mission Impossible, Mk2 Pineapple Grenade, Normandie, Rangers take Point du Hoc, Suicide mission, Swangae on the Isle of Purbeck near Isle of Wight, The beginning of the end for Nazis and Hitler. Bookmark the permalink.